Thanks to advanced tracking technology, recovering lost vehicles and even people has become easier than ever. While RFID-based systems provide location information using small electronic tags, GPS-based programs are more apt for wide-area tracking. This includes Android and iPhone spy apps that not only allow users to track lost and stolen goods, but also let them monitor vulnerable adults and kids. 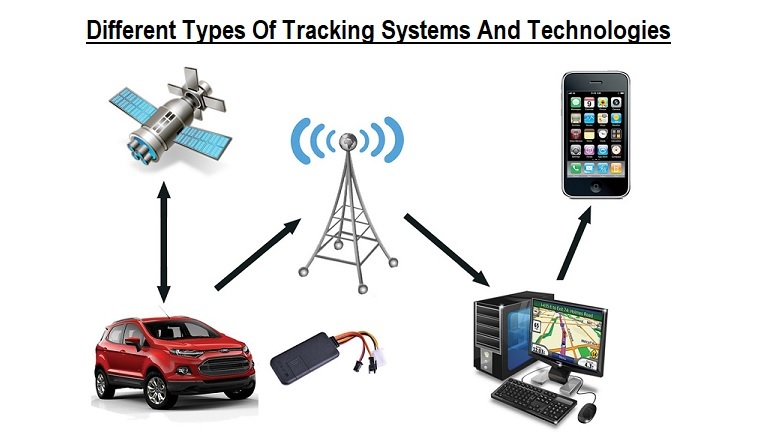 Following are the Top Five Different Types of Tracking Technology and Systems available on the market. Radio frequency identification technology is used in several fields. Unlike an Android and iPhone spy app, the technology tags comprise an antenna that has the ability to send and receive radio signals, and a small chipset holding the broadcast information. When the device receives radio signals, the tags use the energy in order to broadcast a weak response. Active tags, on the other hand, contain an integral power source that significantly boosts signal strength and range. This makes it more suitable for outdoor tracking. Long distance Radio frequency identification tracking is directional. Meaning, the users can easily determine the approximate range and direction of the tracked item. The Global Positioning System is also integrated into tracking devices. These trackers incorporate a GPS receiver that enables the device to determine its approximate position and report that data with some sort of mechanism. This kind of technology usually takes the form of a cellular link or radio transmitter. However, survival GPS locators used in ships and planes often have a satellite receiver for global reach. As a result, these systems are more expensive and bulkier than Radio frequency identification tracking solutions. Having said that, they also have a greater range and ability to pinpoint the location of an item or person of interest from a greater distance like an iPhone and Android spy app. Geofencing is a more impassive form of tracking that can make use of GPS or RFID technology. In this advanced monitoring system, rather continuously reporting its location, the tracker uses an innate receiver to detect its current position by GPS or by proximity to a radio scanner. As soon as the transmitter goes beyond a designated area, it trips an alarm or notifies the violation through a transmitter. One prominent example of this type of system is loss prevention scanners placed at exit doors of retail stores, which set off an alarm the minute an active tag enters their scanning range. An Android and iPhone spy app is another example of geofencing that can be used to define safe and unsafe zones so the users can actively keep tabs on the target’s movement by receiving alerts when a person of interest goes enter or leaves a designated zone. Parents and guardians leverage this technology to ensure their kids’ safety. They send out distressing signals when a child leaves school or home outside of approved hours. Internet tracking is another way of tracking that aids the owners of laptops and other mobile computing devices trace and recover stolen hardware. Many portable computing devices boast an optimal tracking system in the BIOS that can delineate to central servers whenever the computer establishes an internet strong internet connection. This means the device provides wireless data for geographic triangulation and IP information. Some computing devices even have the ability to snoop on thieves’ online communication and internet browsing enabling the user to gather necessary data that will help them identify the perpetrator and recover the stolen equipment. An Android and iPhone spy app is an all-in-one solution that works in tandem with the built-in GPS technology on a mobile device (smartphone or tablet) to determine the current location of a person of interest. These days the sophisticated and reliable iPhone and Android spy apps can even register the record of all the sites that a target has visited. While the device fails to connect to the internet, these apps continue to record all the locations visited by the monitored individual. And when the mobile device connects to the internet the Android and iPhone spy app immediately upload all the data of visited places. In fact, a handful of cell phone monitoring apps can even set virtual confines around the designated places such as home, workplace, parks, tavern or pub, etc. with the geofencing functionality. The powerful feature notifies the user about the activity in the specified zones, so he or she could take immediate action or save it as a proof. Since an iPhone and Android spy app not only finds the target but also provides each location with the exact time and date stamp, so you know when exactly the monitored person has visited a particular site.